This is a companion piece to Silver Bells - three bells in different sizes worked in festive colours of red, green and gold. 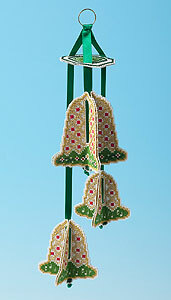 The bells are hung on green ribbon from an embroidered platform and the overall length is about 34 cms, but you may adjust this as you wish. Kit contains stitching paper, stranded thread, ribbon, metal ring, needle, chart and full instructions.